The demand for wood pellets continues to grow each year, as more and more consumers turn to alternative fuel sources in an effort to save money and protect our environment. Indeck Energy Wood Pellets are the solution to providing a consistent, high quality renewable fuel. Superior value | Our pellets deliver more heat for the money. Reliable heating | Our pellets provide a very clean burn. Cleaner stoves | Our pellets generate less ash. Exceed industry standards | Our pellets are the most consistent quality product on the market. Environmental sustainability | Our pellets are produced from feedstock that is sourced from sustainably managed forests. 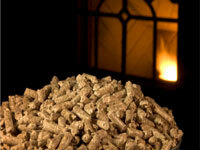 Indeck Energy Wood Pellets are available for residential or commercial use in bag or bulk. The consistent quality of our premium grade wood pellets stems from our regimented and proprietary biomass sourcing plan for superior feedstock. The Indeck Ladysmith BioFuel Center biomass sourcing plan is managed through biomass aggregator and partner, Midwest Forest Products Company of Hayward, Wisconsin. Biomass feedstock is procured through sustainably managed forests in addition to quality waste wood fiber from milling operations in the form of chips and sawdust. Indeck Energy performs real-time batch testing to ensure consistent manufacturing and quality of our Indeck Energy Wood Pellets. Additionally, we send samples to Twin Ports Testing for third party analysis to further ensure our pellets are of top quality. Twin Ports Testing has been involved with the wood pellet industry since 1985 and is a leader in wood pellet testing and analysis. For more information on Twin Ports Testing, visit http://www.twinportstesting.com/chemistry-laboratory-services.php. Indeck Energy is a member of the Pellet Fuels Institute (PFI), a North American trade association dedicated to promoting energy independence through the efficient use of clean, renewable, densified biomass fuel. PFI establishes and maintains biomass fuel standards, provides technical expertise to the pellet industry, and educates consumers about the proper use and benefits of using this clean, renewable energy source. For more information, visit www.pelletheat.org. Everyone who tries these pellets comes back and says they've got the best burn and are super clean. And they're a reasonable price. I burn them at my house, too.